I didn't post the map links directly and the first two are rather large. However, what they represent is a remarkable representation of precolonial Mesoamerica, stretching from central Mexico into Central America, in the Postclassic period. The Postclassic period established the patterns and identities which still characterise the indigenous peoples of the region today. Far from being a period of decline for Mesoamerican civilisations, the area positively flourished. 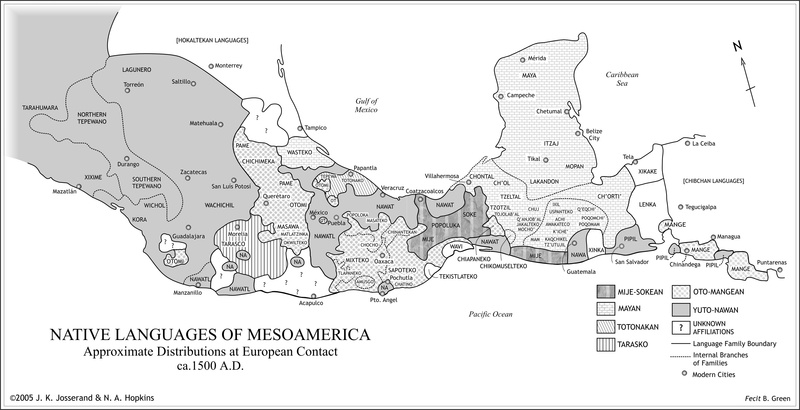 Now, some remarks on the states of Postclassic Mesoamerica. The Aztec Empire was formed by the Mexica or Nahuatl people. It conquered a number of existing states, yet there were numerous kingdoms including ethnically and culturally Nahua ones (most notably Tlaxcala) which somehow evaded Aztec dominance. The Postclassic Maya were divided by ethnicity, and Yucatan was a patchwork of princely states. In what is now Guatemala, the Mam, Qechi and Kaqchikel peoples formed the main Mayan kingdoms. What is now Oaxaca was dominated by the Mixtec and Zapotec, while Mixe and Zoque peoples also formed their own states. West of the Aztec heartland in what is now Tarasco state, the Purepecha people formed their own empire which was one of the largest polities to never be conquered by the Aztecs. The Purepecha failed, however, to fully subjugate the kingdoms to their west. The Chichimeca peoples in the northern fringe of Mesoamerica were apparently regarded as "barbarians" by those further south, although the accuracy of this claim is uncertain. Furthermore, the Huastec are related to the Maya yet geographically far separated. Today, the Nahua, Maya, Mixtec and Zapotec are the four largest indigenous ethnolinguistic groups in Mexico, and Yucatan and Oaxaca are two of the states with the largest indigenous populations in terms of percentage.